This was possible because of an unique - at the time - Nepro patended electric (mini)buzzer, later called Elesonic/Elevox, initially released for the first mechanical (mini) travel clocks - like Nepro Minisonic - cca 1967-1970. I used to have lots of Nepro clocks of all different styles, I still have a few, but never seen this watch before, I didn't know they made one. I'm pretty sure I have, or had, a clock the same as this but not converted to a watch. And You're right: back in 1970, basically Nepro has converted one of their successful line of mini travel alarm clocks with electronic buzzers (as the one You've had - probably a MiniSonic), into the first wristwatch with electronic alarm. And btw, Nepro name is an abbreviation for 'New Products'. When I'll have some time, I will take more photos with the watch disassembled, to illustrate what You've said. Just looked through the ones I have and found one that looks like the watch, the sticker on the box says 'time book' not sure if that was the official name for it but the cover does make it look like a little book, here it is.. Sorry the images are huge I'm on the iPad so couldn't resize them. Thanks a lot for the photos! Yes, You've found EXACTLY the right one! My Nepro Zanzara seems to be exactly the same watch but put in a silver case with a wrist band...and named Nepro Zanzara! Last edited by cybr on 18 Sep 2016, 19:35, edited 3 times in total. Some good news about my Nepro Zanzara: I just had the Zanzara and its FHF 69 movement serviced by my favorite watchmaker (I had to wait almost 3 weeks for him to finish the job - and I may consider myself lucky, even if he was also intrigued/interested about this quite rare watch , because the guy is really a wizard regarding old movements and has quite many requests!). But I provided him all the "ancient" documentation I have found about the Nepro Zanzara and its quite strange patented contacts, so the watch (and its quite old 1970 movement/unique electric alarm/Rotocontact) is now in an excellent working condition! 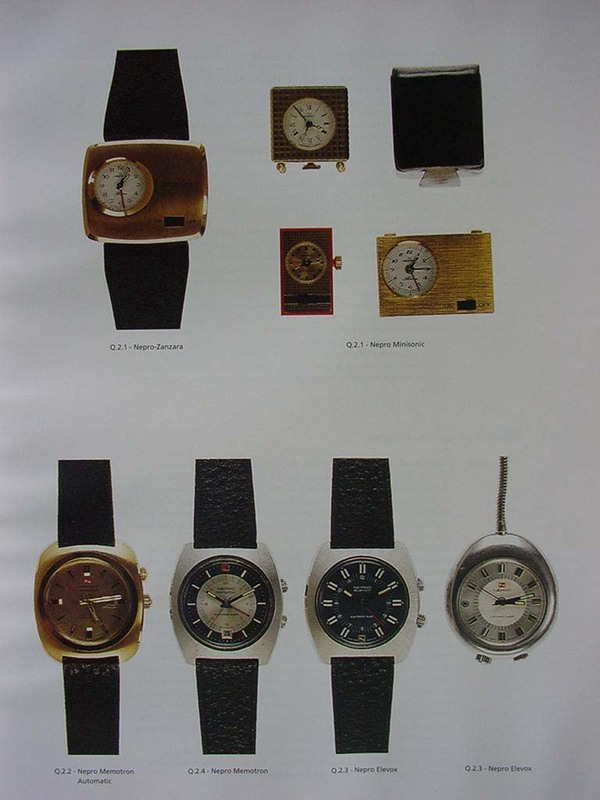 I may consider myself lucky to find a "miniature" and "boxed" gold-plated Nepro Clock - the closed BOX seem to have about 45 mm x 35 mm x 15 mm - very similar with my "wristwatch" Nepro Zanzara and with the "Time Book" mentioned above by Richard!